Outdoor Skating an Icy BLAST! Outdoor ice skating in East Lansing is sure to be wildly popular. Be a part of it! Love skating outdoors but havent had a way to do so in Greater Lansing since the closure of Washington Park&apos;s ice rink? Wait no longer my frost-loving friend! Modeled after similar rinks in Howell and Holland, it will be the only outdoor rink in mid-Michigan - but just like cold weather itself, it will only be around for a limited time, February 11-25 in Valley Court Park from the hours of 3 p.m. to 9 p.m. weather permitting. The two-week period is both weather-dependent and a pilot program designed to see if people come out and skate. What does that mean? Use it or lose it! Don&apos;t come empty-handed folks because East Lansing skaters will have to provide their own equipment. There wont be a concession stand either, so bring your own thermos of hot cocoa and a pb & j in your pocket that you&apos;ll squish when you fall. The rink is about the size of one youd build in your backyard and is estimated to comfortably hold around 40 skaters. The Valley Court Park is best-known for the outdoor showing of movies in the summertime but this rink is sure to bring the community out despite the cold. Just west of campus, the area has a good amount of parking and is still close enough to East Lansing businesses so patrons can get a bite to eat before or after the skating fun. And dont think the dates of the rink being open is an accident. What holiday is coming up? For you guys with thick skulls, its the romantic one... Can you think of a more romantic date for Valentines Day? The city will eventually be asking for volunteers to help put the rink together if you want to be a part of things in that way. Other residents and interested parties will be tasked with shoveling off the ice surface after a snowfall or monitoring skater safety. While the official call hasnt gone out yet, you can learn more at the city of East Lansing website. 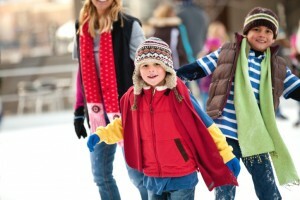 Come on out and have some fun this February ice skating in the great outdoors.